Like floating on powder. 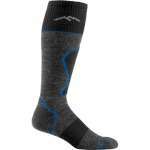 The Darn Tough Over-the-Calf Padded Cushion Ski Socks have cushioning on the bottom of the foot and shin area which makes this sock the gold standard for comfort and performance on the hill. Targeted shin padding means you can leave the shin bang in the lodge.